The Magnum struts down the street flashing its custom-styled 21” front wheel that makes it clear this is truly the king of style. This premium cast wheel delivers an outstanding ride and smooth, easy handling – along with custom style no standard bagger can match. To enhance the visual impact of the custom-style 21” front wheel, and to give the Magnum a slammed, custom-shop look, the rear end is lowered 1”. There’s no compromise in the great ride or easy handling, just a significant increase in full-throttle custom style. Pump your personal riding playlists through our highest-performance audio system ever. Integrated in the custom-painted fairing are 6 speakers that serve up 100 watts of premium sound. Plus, you can crank it up even further with a set of accessory saddlebag audio (sold separately) that complement the fairing speakers. Magnum-exclusive custom style is a symphony of color-matched painted features that complement the beautiful finishes on the sleek bodywork. From end to end, this stunning bagger has Painted Rear Fender Closeouts, Color-Matched Saddlebag Hinges and lock bezels, Color-Matched headlight/taillight bezels, a Painted Dash, and Painted Radiator Shroud. The Rear Fender Closeouts complete the custom look, covering seams and hardware with smooth, color-matched bodywork. Victory Magnum riders rule the streets with custom style and performance. 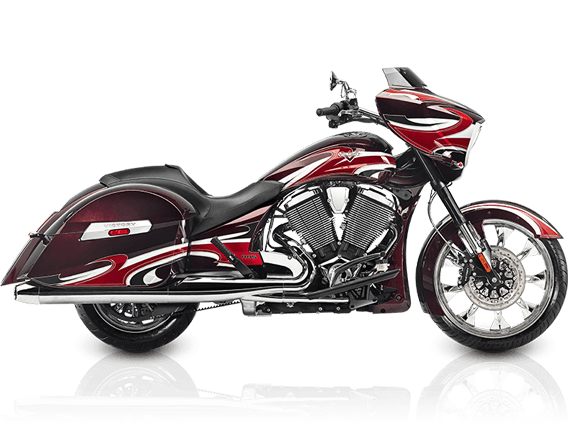 The 106-ci Victory® Freedom® V-Twin delivers 106 ft-lb of torque, and it’s a smooth, efficient engine – counter-balanced and fuel-injected. The 6th gear overdrive of the Victory 6-speed transmission drops the RPMs and delivers the smooth ride you’re looking for. Cruise control enhances your comfort, and Victory Anti-Lock Brakes give a rider greater confidence and peace of mind. Out on the open road, the automotive-quality cruise control lets you relax and enjoy the ride. With Victory ABS, when traction is compromised, the ABS immediately and automatically provides reliable braking to help you stop quickly and under control. The 26.3” seat height is the lowest in its class. Riders with all inseam lengths will be able to plant both feet firmly on the ground. A lower seat height provides the rider with greater control of the bike and enhances a rider’s confidence at low speeds and when stopped. 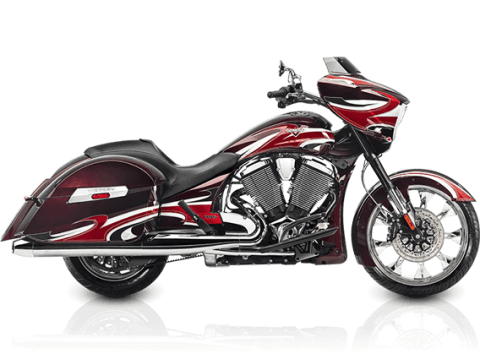 Add Victory Accessories and customize your Victory Magnum™ to suit your individual style. All Victory accessories undergo the same rigorous testing as our motorcycles, so they install easily, fit properly, and deliver outstanding performance. Front: 21 x 3.5 in. Rear: 16 x 5 in.